Fished Lavon again tonight. Caught a few white bass and drum before the rain. Bites slowed down considerably after the rain started. Tried a couple of poles for catfish with shrimp and cut up perch. The cats were not biting tonight. Water was coming over the tops of the gates occasionally, guessing from larger waves. Fished Lavon this afternoon and up till about 9:30pm. Caught a couple of nice crappie and saw several keepers pulled out. More white bass all sizes. Got my fist catfish in the last couple weeks about 3 lbs on shrimp. Cats did not like cut up drum or shad today. Little cats under 1 pound ate a lot of my shrimp. A few drum were in the mix also. Bite stopped about 6:30 tonight. Corps doubled the release rate to close to 4000 cfs. No more water coming over the top of the gates or short bursts of water under the bottom. Fished the dam last night. All gates open but one in the middle of the dam. Lake level is down to about 1.6 foot high. Could not find any shad with cast net. Saw a few folks catching a couple small crappie, did not see any keepers. Fished the dam again tonight. 3 poles out each with 2 hooks having cut up fresh dead shad and perch no bites. Did see one nice catfish caught. Saw a few crappie that were right at keeper size. Corps really cranked back the release from about 3600 cfs this morning to just center 2 gates open and 810 cfs. Lake is not just over 1 foot high. Guessing ramps should start opening up again in a week or so once the soil under parking lots, roads and ramps stabalizes. Fished Lavon Friday morning , late start , got on the water at about 9 a.m. I headed straight to the spot that I think everyone refers to as " Glass house point ? " I found huge bait balls , the shad that jumped out of the water were maybe 2 inches . Most of the fish I caught were in 30 ft of water . I caught several white bass , Stripers and Blue catfish . 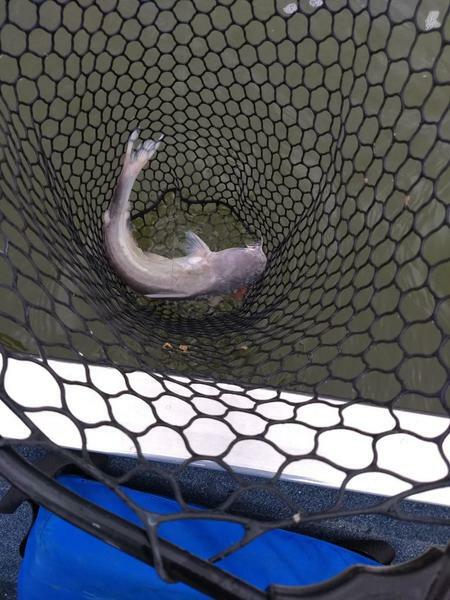 The catfish were caught on Stubbies dough bait on circle hooks about the size of a quarter . The bass were caught on 1/8 yellow jig heads with live minnows . 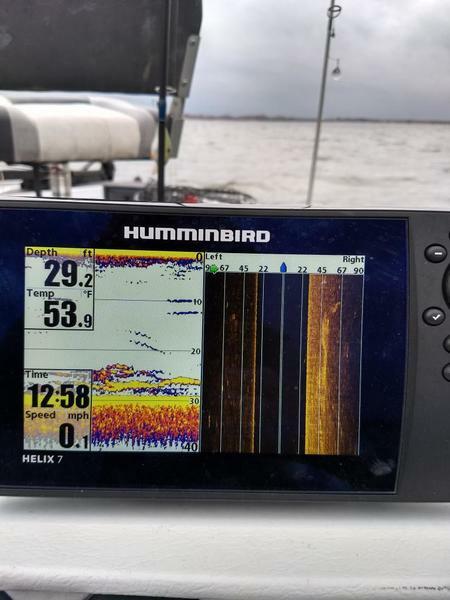 I did not get any bites until I started thumping on the bottom of the boat, and then everything I saw on the bottom started coming up and hitting my lines . The weather turned bad at about 11 am with winds to strong for me to hold position. My fish finder clock is 2 hrs off , I'll have to try and figure out how to set that . I wish I could afford a Bobo thumper , evertime I stopped thumping to real in lines the fish stopped biting . 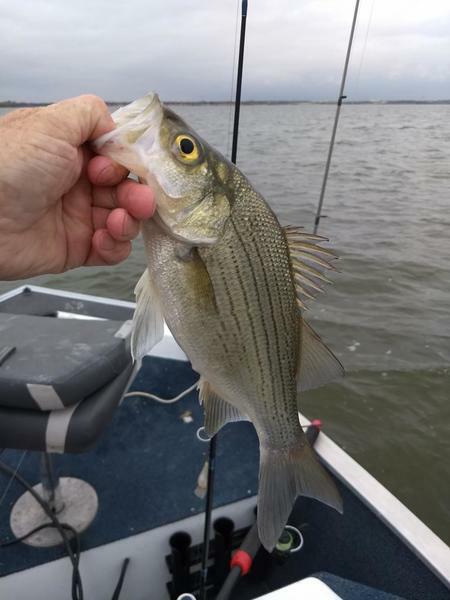 I am a novice fisherman so It was very exciting to me to catch catfish along with white bass and stripers at the same time . Last edited by DarrellSimpson; 12/01/18 02:10 AM. I forgot to mention , only Collin park and if I remember correctly highland park ? Have open boat ramps. Collin park does not have a dock so you will have to beach your boat if you don't have a copilot. Last edited by DarrellSimpson; 12/01/18 05:06 AM. 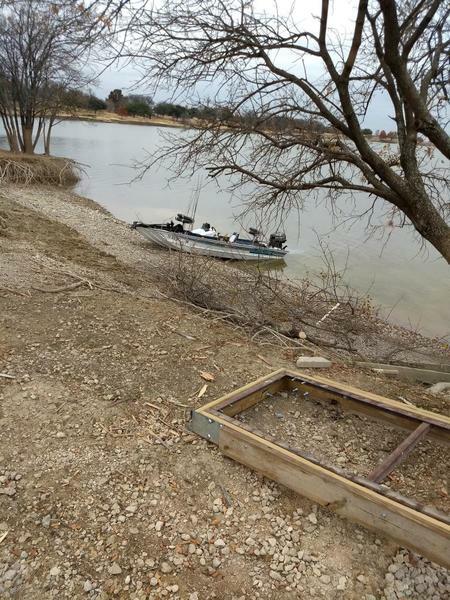 The corps opened Highland Park and Twin Groves boat ramps yesterday. Highland Park does not have a ramp and no good place to beach the boat. You can get lake updates on open facilities, lake level and release info by calling the :Lake Lavon Office at 972-442-3141 and pressing 1. Lake is down to about 1 foot high. By Friday the corps has opened the following ramps:Highland, twin groves, brockdale, Lavonie North, Mallard, East Fork Marina. I went by Mallard Park on way back from fishing tonight to look at the ramp. Water is down well below the parking lot. There is no courtesy dock at Mallard Park. I believe water is in that range where you can not beach boat on top of drop at shorline and too deep to get out at shoreline. Would probably need to beach boat on ramp. Went to Mallard Park today to look for some catfish and crappie. Decided to go towards 78 bridge, put out juglines along the riprap and fish the bridge and surrounding area. Put out 3 jugs along rip rap near the bridge. Each jug had gizzard shad on one hook and mashed up minnows wrapped in cheese cloth on the other. Used minnows on one pole for crappie and had a catfish pole out with 2 hooks each having part of a shad. Fished from a little before 3 - 6:30 no bites. Really did not see many fish there on the finder either. Put on a square bill crank bait and threw out along the rip rap and trolled it behind my kayak as I came back in. No bites there either. I was hoping fish would go back in the cove since the creek would have recently been flowing but I must have gone the wrong direction today. Maybe I will have better luck on a small lake tomorrow. My son is in for a few days for Christmas and we are planning on going kayak fishing on Lavon tomorrow, Saturday, afternoon/evening. Thinking of bringing some shad, put out some jugs and then having a pole out for cats and one for crappie. Trying to decide between fishing just north of Lavonia or along the creek channel at Twin Groves. Any thoughts on where we might find some fish? Ocelot, sent you another message, let me know if you don't get it. Fished out of my kayak from Colin Park this afternoon/evening. Went north staying in the 20-25 foot range. Seemed that there were fish most of the way to the next ramp to the north at about 22ft. Was going too fast going up and used a 30inch drift sock coming back. had me going too fast, successfully drifted last 1/2 the way back in desired depth range. Tried shad on one pole and stink bait and worm on another behind the boat. Tried rooster tail with small crank bait trailer changing to a jig trailer with small blade behind when going against the wind/waves and fan casting while drifting with wind. I could not get anything to bite. Corps clocked wind speeds up to 16MPH, forecast was for winds below 10 getting lighter as it got later and about 10 degrees warmer with some sun. Forecasters totally missed it today. Fortunately stayed nice and warm except for my fingers when the flip mitts were open. First trip with the drift sock, have some more learning to do but pretty nice. Not too cold today, at least my fingers never got cold. Overcast, foggy and misty with very little wind. Do not know why I only saw 2 boats on the lake today. Fished out of Colin Park using chicken, worms, stink bait, rooster tails, deep running crank baits, jigs. Not a single bite despite seeing a lot of fish in the area. With light wind and the drift sock am sure I was not going to fast today. It was good to be able to get out on the water after a couple week break. Tried fishing below the dam for a bit around sunset. Fished from bank where water narrows down near the creek. One pole out with chicken. On the other tried slab, deer hair jig, crankbait and chatter bait. No one I ran into had any luck either.